Researchers from the China-Japan Friendship Hospital report indomethacin IUD are effective and carry a low risk of complications, including expulsion, bleeding and pain. The study examined the effects of the IUD for 60 months or five years after implantation. IUDs are considered a safe and highly effective means of contraception. After the device is implanted, women have continuous protection against pregnancy. 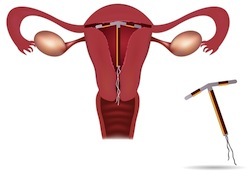 Researchers investigated the side effects of two different IUD implants in 1,000 women implanted with the devices from October to December 2004. Follow-up appointments were scheduled at one, three and six months. There were further appointments at one year, two years, three years, four years and five years post implantation. At the conclusion of the study, researchers found no serious complications in patients with the indomethacin IUD compared to the control group. When all side effects, including expulsion rate, pain and bleeding were taken into consideration, the indomethacin IUD performed better than the control IUD. Source: Wang LY, Li SZ, Wu SY, Zhao YH, Wang Y. A random control study of indomethacin-containing MYCu intrauterine contraceptive device for 60 months. Zhonghua Yi Xue Za Zhi. 2013 Feb 19;93(7):496-9.